Currently the largest secondary school library in the United States, housing 160,000 volumes. 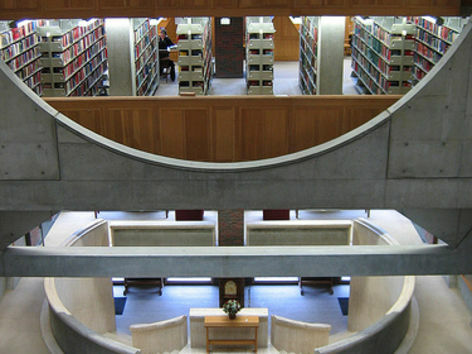 The Phillips Exeter Academy Library at Phillips Exeter Academy in Exeter, New Hampshire is among the renowned masterworks of architect Louis Kahn. The building is organized around a 5-story atrium, providing the reading room with even, diffused daylight all year round. 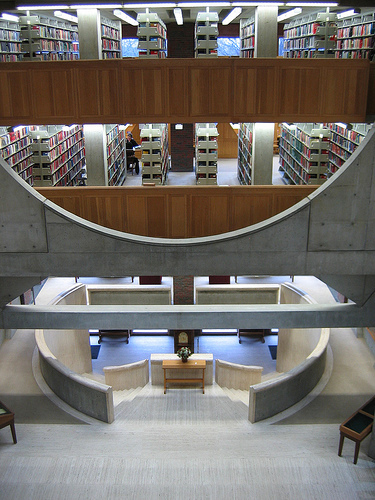 Balconies containing the stacks and study alcoves encircle the atrium. In 1995, the library was officially named the Class of 1945 Library, honoring Dr. Lewis Perry, Exeter's eighth principal (1914-1946). I really have to marvel at the construction. I am very impressed when bricklayers get everything right and they had to on this building. There is a sense of monumentality when you walk up to the building and look up the piers. He is known for this quote, “between silence and light and you can always find yourself in silence,” and in many ways his buildings allow us to deeply think about our lives because they give us the silence to be able to understand our relationship to the world. Home to the Boston Red Sox since 1912, Fenway Park holds a special place in the hearts of fans and players alike. Deruyter Butler, Atlandia Design; Steve Wynn, Jon Jerde, The Jerde Partnership, Inc.